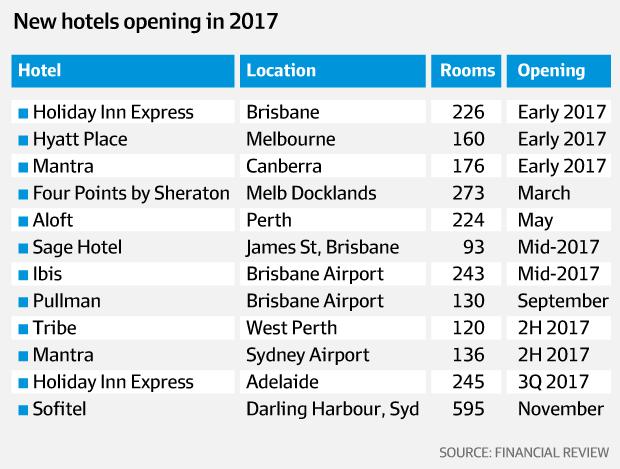 Australia’s booming hotel sector is set for a massive injection of fresh supply this year with new hotels to open in Sydney, Melbourne, Brisbane, Adelaide, Canberra and Perth. Some of this new supply will put downward pressure on daily room rates and occupancy levels in weaker markets such as Brisbane and Perth. But in Sydney and Melbourne, where occupancies are near 90 per cent at the luxury end, expectations are for new supply to be more than matched by demand. “2017 will be a record year for new hotel openings,” said CBRE Hotels national director Wayne Bunz. The click-over from investment to new development is a natural progression for the hotels sector, which is enjoying its strongest run in decades. This has been underpinned by record numbers of overseas and domestic tourists with the weaker Australian dollar a key factor in this resurgence. Tourism Research Australia forecasts are for international visitor numbers to rise 8.3 per cent this financial year to a record 8.3 million, led by China, and reach 12.3 million by 2024-25. Domestic visitor nights are forecast to reach 432 million by 2024-25 up from 340 million, according to TRA. With many of the trophy luxury CBD hotels snapped up in recent years (mostly by Asian investors) this rising underlying demand for hotel accommodation, combined with much stronger operating conditions, is driving the new wave of hotel completions, which will continue until at least the end of the decade. “Investor appetite is as strong as ever. We’re getting substantial inquiry from major Asian investors looking to get a foothold into Australia but the biggest challenge is the availability of assets to buy,” Mr Bunz said. CBRE recorded $2.5 billion worth of hotel deals last year, well down on the record $3.9 billion of deals negotiated in 2015 when many of the country’s top hotels changed hands. “Counter cyclical opportunities will arise for astute investors in areas such as Brisbane and Perth. However, we expect that most deals done in these markets will be off-market deals rather than on-market,” Mr Bunz said. The new wave of new hotels coming on board this year range from economy to luxury and are backed by the world’s biggest hotel operators including Accor, Intercontinental Hotels Group, Hyatt and Marriott and Starwood, many of whom have introduced new brands to the market, alongside local players such as Mantra, Event and TFE Hotels. Among the new hotels to open will be the highly anticipated 600-room Sofitel Hotel at Darling Harbour at the recently opened International Convention Centre. 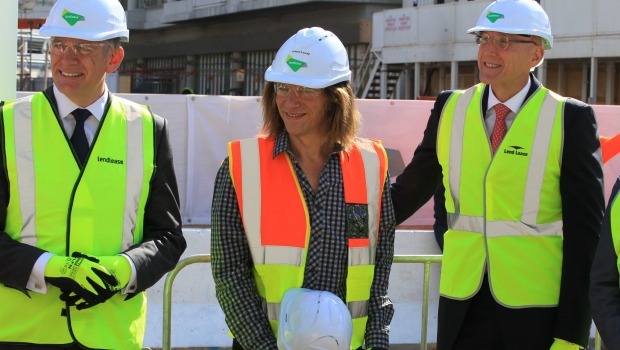 Developed by Lendlease, owned by hotel magnate Jerry Schwartz, and operated by Accor, the 35-level hotel will be the first new five-star luxury hotel to open in Sydney in 20 years when it starts trading in November. In Melbourne a new Four Points by Sheraton Hotel operated by Starwood will open at Docklands and a new Hyatt Place business hotel will open soon at Essendon Airport. Brisbane Airport will add 373 new rooms when two hotels – a Pullman and an Ibis – open this year. Hotel developer Pro-invest will continue its roll-out of Holiday Inn Express hotels with two to open in Brisbane and Adelaide while ASX-listed Mantra Group will open its first Tribe Hotel in Perth and new Mantra hotels at Sydney Airport and in Canberra. “This year we have one of our strongest pipelines of new hotels. Market conditions are very good for room rate growth,” said Simon McGrath, chief operating officer of AccorHotels’ Pacific division. “All markets are relatively strong. We even see Brisbane and Perth showing signs of strengthening,” said Mr McGrath who oversees the country’s biggest hotel portfolio. He highlighted the pre-Christmas purchase by Accor of a portfolio of 15 Ibis and Ibis Budget hotels from the Abu Dhabi Investment Authority for $200 million as “indicative of investor confidence in the Pacific region”. While large Asian institutional investors have been the primary buyers of five-star hotels – the standout deal for 2016 being Chinese developer Greaton’s acquisition of the $700 million Ribbon project from Grocon including a new W Hotel – the biggest owner of hotels is Harry Triguboff’s Meriton serviced apartments group, followed by the Schwartz Family Company and ASX-listed Event. In the operator stakes, Accor remains the biggest player with over 27,000 rooms followed by Mantra Group, Choice and Toga. Regional markets are expected to benefit from the boom in tourism with Mantra boss Bob East tipping Cairns in far north Queensland to be the best performing travel destination this year based on revPAR growth. “Cairns is well positioned to take advantage of the opportunities presented out of Asia, particularly with its large leisure travel market attracted by Cairns’ close proximity, single flight offering and favourable time zone,” Mr East said.